“According to the birth parents, the birth father was born of a farm family in Kyeongsan, Kyeongnam province. In 1975, he was married to the birth mother and did farming. 5 years ago, he started to work as a farmhand at a stock farm. 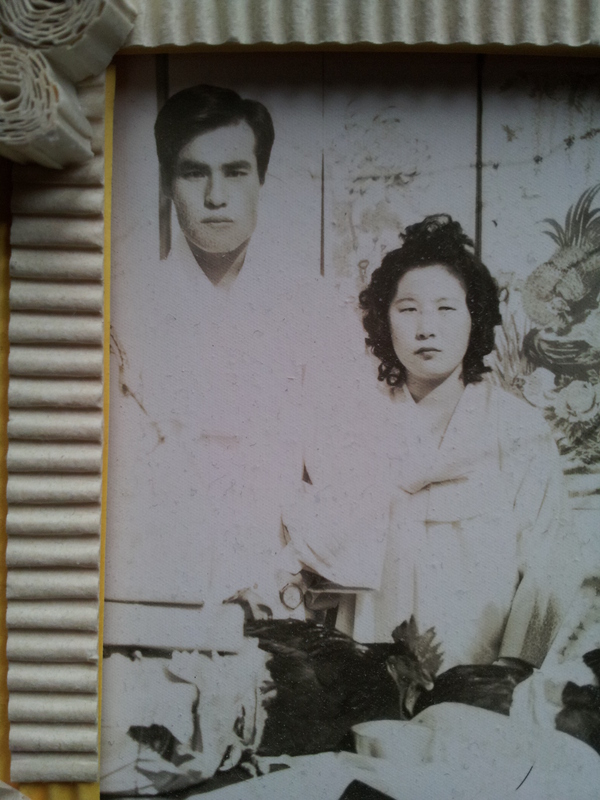 The birth mother was born of a farm family in Keyongsan, too. She had to stop schooling after finishing primary school for financial reasons, and did household work. At 22, she married her husband and cared for her home only. They had 3 girls: Mee kyung (10), Mee Sook (6) and Mee Nam (4). In fact, his income from his poor job can barely cover their living expenses support the 3 children. They felt unable to raise one more child. Though they were heart-broken, they decided on the child’s adoption placement for her better growth. ** She, 150 cm tall, 45 kg of weight, blood type O, out-going, cheerful. An arranged marriage. The wedding day was also the first day the two of them met. Our paternal grandmother, who was the matriarch of the clan, strongly favoured grandsons. At that time it was nothing unusual among the older generation; only the sons would inherit the family name and later on care for their elderly parents, and only sons could do the important ancestral rituals held during Chuseok. The grandmother would punish the family by purposely ignore our mother and my sisters at such family gatherings. In the 80s, many women would give birth at home and only be cared for by their in-laws instead of going to the hospital. When Mee Nam was born, and upon seeing it was another girl, the grandmother immediately left their home in rage after destroying some of the family’s important belongings. This also meant she was leaving our birthmother with a newly delivered baby and two small children of 2 and 5 years of age. So when our biological parents found out about their fourth pregnancy, they hid it from the rest of the family. It was an act out of fear. If it turned out the baby was a boy, they could ask for help from their relatives. But if the baby was a girl, they decided they would have to give her up. My mother made up an excuse and went accompanied with her sister to a hospital in the city, where I was born. Our mother visited the adoption agency maybe twice after that, trying to get any news or information about my whereabouts or wellbeing. The social workers told her to forget about me. As soon as the grandmother died and after we were reunited, my biological family decided to openly tell the rest of the family about me. Wow! Vad fint ändå, liksom. Haha, personligen tycker jag att det låter lite som om de ger bort en kattunge ;) Men adoptionsbyrån var lite dåliga på att beskriva förloppet.